I love eating colorful food, and beets have one of the most gorgeous natural hues! 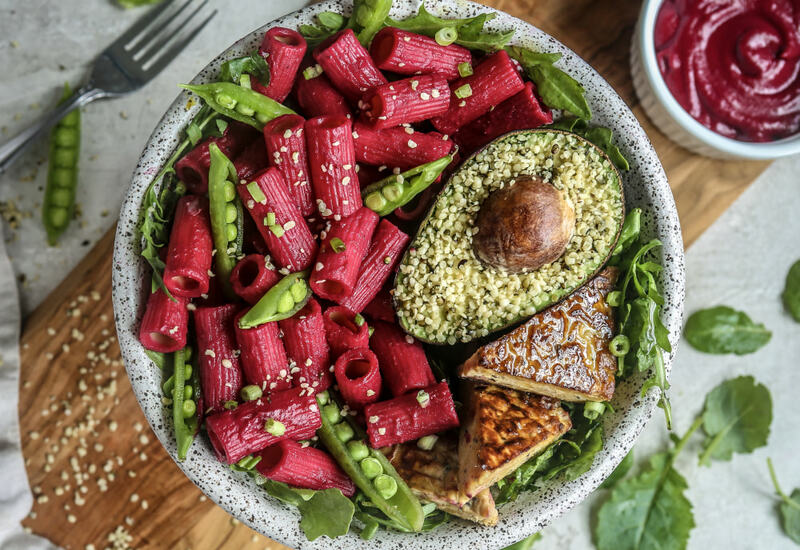 I was inspired by a beet hummus I often make to create a quick healthy sauce for pasta. I’m always looking for an alternative to the traditional tomato or pesto sauce. This one is so simple and so delicious! If you’re a fan of beets, you’ll love it. For large beets, cut in half to reduce cooking time and ensure they cook through. Optional: pair with avocado, greens, and some tempeh! Replace pasta with spiralized zucchini or a chickpea pasta for extra protein. For non-vegan, replace vegetable broth with bone broth. Per Serving: 331 calories; 8g fat; 53.9g carbohydrates; 10g protein; 0mg cholesterol; 356mg sodium. Earthy flavor from the beets is a great idea, and this is a really beautiful color. A feast for the eyes and the belly. I am a nutritionist and love that this is naturally such a beautiful color. Adding an earthy flavor to pasta is such a great idea!